Let's see if you recognize this pattern: Team A falls behind early by a run or two and can't get anything done against Team B's starter. Around the seventh inning, Team B has to go to the bullpen, and Team A suddenly rallies to steal the game. If you identified this as the Giants' modus operandi at home in 2011, you are correct. But the same narrative could also be used to describe the three losses the Giants absorbed on their most recent road trip to the American Midwest. The Giants simply aren't used to blowing leads, and we as fans are not used to seeing them blown. It's disconcerting when the best bullpen in baseball doesn't deliver the goods. 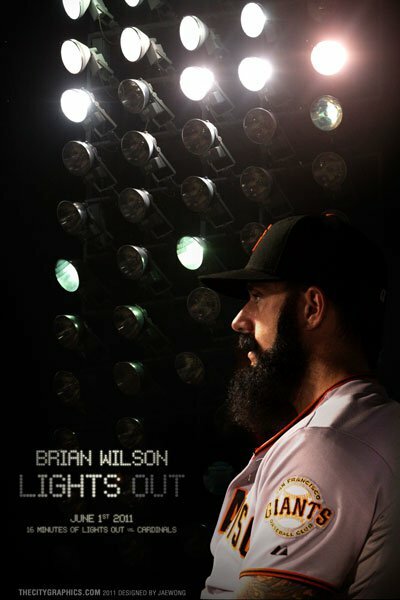 Now that Brian Wilson has been elevated to a godlike status not just by the Giants and their fans but by the marketing execs at Major League Baseball™ who know a good cow to milk when they see it — please to consult the Ubaldo Jimenez mini license plate spot ("Zander?") — the ninth inning has a cone of pride and ego enveloping it. And when the cone is pierced, it lets loose a primal roar of frustration. The thing is, we all know it's not their fault. We know we can't blame Sergio Romo for his occasional flat slider. We can't fault Javier Lopez for that one time out of a million he allows a hit to a lefty. And much as we'd like to, we can't get all that pissed at Brian Wilson. For anything really. The guy is a beast. He's been a beast for the past three seasons. It's time we accept that behind all the antics and that tattoos and the beard and the Machine, we have one of the premier closers in the game, and he's constantly nurturing his craft. (That two-seam dart he's developed this year has the potential to make him untouchable.) But even B-Weezy has nights where it's just not working. It just so happened that he had two of those nights this week. The '09 comparison certainly holds water in the win column. Through 85 games in 2009, the Giants were nine games over .500 with 47 wins. Through 85 games in 2011, they're just one win better and 11 games over. The difference lies in the standings. The 2009 Giants trailed the eventual Division Champion Dodgers by 7 games for the N.L. West lead and were already thinking Wild Card. In 2011, los Gigantes are three games clear of the Diamondbacks and the Dodgers have fallen into the cellar of a much-diminished division. To be fair, there's more parity across baseball this year, with the lowly Pirates suddenly competing for the Central Division lead and even the Nationals playing .500 ball. And the Giants still possess the N.L. 's third-best record. But the parallels are there, and that's enough to give any dyed-in-the-wool Orange-and-Black fanatic more a little trepidation. Having said all that, I can't tell you what Bruce Bochy or Brian Sabean could do to improve the status quo. Yes, there are glaring needs for offensive upgrades up the middle — at catcher, second base, and center field. But who's out there to be had for what the Giants are willing to part with? And what GM worth his salt could ignore how desperate Sabean's situation has become? Even a Carlos Beltran — whom the Giants arguably should have made a run at years ago — would come at the cost of Jonathan Sanchez AND more than a few prospects with names like Belt, Brown, and Wheeler. With organizational depth a cornerstone of Bill Neukom's "Giants Way", I just don't see the brass parting with any studs for a rental fix in the five hole. And if you think Jose Reyes will be wearing anything but a Mets uni in August, well... I'll just leave you alone for now. — June 30, 3:12 pm: We've come back from worse and won a World Series. RT @Buster_ESPN: A gut-punch for the Giants. — July 2, 12:37 pm: Crunching split stats for #TeamTigerBlood pitchers, finding some fun notes on Lincecum, like a 3.63 BB/9 at home vs. 2.93 on the road. — July 3, 11:00 am: Thanks, Andy. RT @extrabaggs: @JeffPassan Cain helped him win World Series. Zero ERs in 3 playoff starts. To victors go the spoils.